There’s so much optimism on day one of a camping trip. The fresh air! The slightly tough but enjoyable hiking! The scores of fish waiting to be caught! By day three, though, the reality of mosquitos, heat, and your weak ankles have set in, not to mention your cooler is a swampy mess of floating sandwich detritus. I can’t help you much with the bugs or weary legs, but I can absolutely save you from the plight of cooler swamp. I’d like to think I’m something of a cooler-packing authority. Having now been a Montana resident for some years, camping is as common an occurrence as a trip to Costco—it’s engrained in our weekend routine. The cooler is essentially our second backpack. And yes, there is science and technique to efficient, effective cooler packing, which is necessary if you want to keep your food supply safe and dry, and your beers cold. Who better to share their tips and tricks than experts who spend a lot time outdoors? “Block ice wasn’t a thing to me growing up on the East Coast,” says Lauren McFate, assistant manager of O.A.R.S. Canyonland, a river-raft and guiding company in Moab, Utah. “But Western readers will know what block ice is. That’s way more efficient than ice cubes; it’ll last longer.” She also suggests filling reusable water bottles or jugs with water and freezing them; they’ll act as ice blocks and you can drink the liquid when it begins to melt. (Super-cold beer and soda work well, too.) Once your cooler is mostly full, sprinkle in cubed ice to fill in the gaps. Keep the drain plug open on your cooler so that when ice does melt, it doesn’t pool in the cooler. Air is the enemy of keeping food cold, so packing a tight, full cooler is crucial. The more empty space inside, the more warm air can thaw or warm your supplies. A layer of plastic or even crushed aluminum cans on the bottom and sides of your cooler can keep the ice blocks from direct contact with the warm exterior walls, McFate says. A piece of cardboard cut to the shape of the cooler’s lid and placed on top of your food will also help keep cold air in. It’s tempting to pack your apples with your oranges, your burgers with your hot dogs, but experts say it’s best to organize your cooler by meal rather than by food type. Lay out your food on a counter, McFate advises, and group the ingredients by meal. (Slice a tomato in half and pack the two separately if you’re using them for two different meals, for example.) Then, place all the food for the last day of the trip at the bottom of the cooler where it’s less exposed to warm air, followed by food for the second-to-last day, and slowly up so that the food you need for your first meal at camp is on top. “That way when you’re looking for your lunch tomatoes you’re not rooting around in the dinner zucchini,” McFate says. 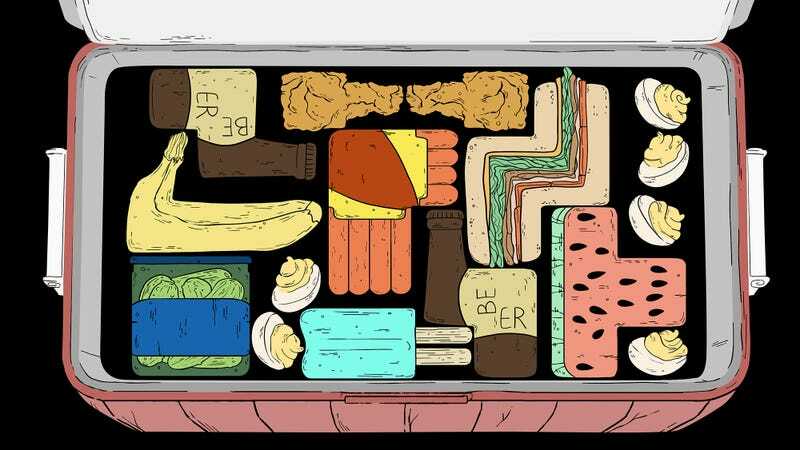 “If it’s organized by meal, it cuts down on the time the cooler lid is open.” On a longer trip, Owsley suggests two coolers: one for later-in-the-week dinners that doesn’t get opened at all until near the end of the trip, and another with meals and beverages for the first few days. It’s all about using containers, experts says, especially ones that seal or snap closed. Stay away even from Ziploc, Owsley says, because “once they’re wet, anything in them marinates.” Some cooler companies sell wire baskets that hang from inside the cooler to keep items like fruits and veggies from touching the ice, no plastic bag required. Raw meat is the exception that does require a plastic bag, so always double-bag raw meat, REI’s experts say. Though it seems handy to tuck silverware and other non-food accessories into the cooler, resist. They’ll only warm up the interior. Keep a separate snap-tight container for items like a corkscrew/bottle opener, twist ties, garbage bags, hand sanitizer, and trash bag. All food scraps, chips, and non-refrigerated items should go into a bag or separate container, not into the cooler. Give it its own cooler, experts say. The lid on that cooler will be opened more often than the food one, most likely, and even if your beer is a little warm at the end of the trip, it won’t pose a health risk like warm chicken would.